The Pentridge looks fantastic in old fireplaces, with companion sets and log baskets surrounding it. One of the main exterior features of this unit has to be the gorgeous Celtic pattern running along the stove’s face. It has a good sized flat top that is great for cooking and boiling on. The thick cast iron body retains for a long period of time which reduces the need to re-fuel. The Pentridge has a range of features including an airwash system, multi-fuel riddling grate, air tight seals and a choice of top or rear flue outlets. A top air control allows the air to be directed down the glass to keep it clean and add secondary air to complete combustion for a more efficient stove. (75% efficient). 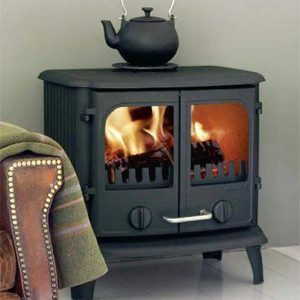 This 7-8kw stove has an ample combustion chamber that can be filled with good sized seasoned logs. 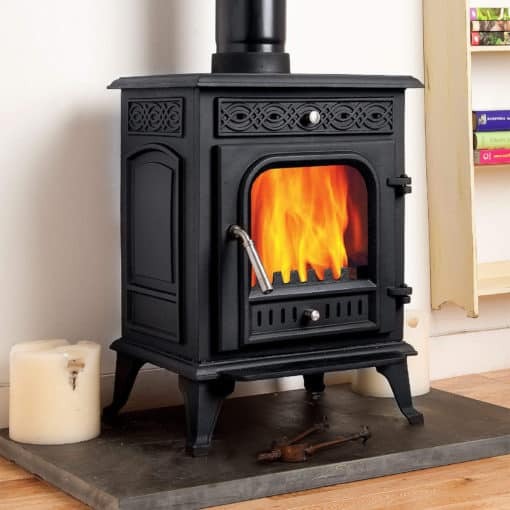 One of the main exterior features of this unit has to be the gorgeous Celtic pattern running along the stove’s face. The Pentridge looks fantastic in old fireplaces, with companion sets and log baskets surrounding it. It has a good sized flat top that is great for cooking and boiling on. The thick cast iron body retains for a long period of time which reduces the need to re-fuel. The Pentridge is hand made from thick Australian cast iron virgin ore and has a very smooth blemish free surface. Many stoves, including expensive brands still use re-melted scrap for their castings. The high phosphorous and sulphur content of re-melted scrap leads to subsequent cracking of the stove. Air tight seals, and smooth door mechanism. 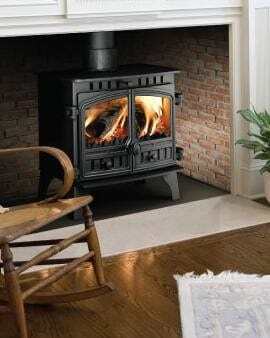 I am a HETAS registered multi fuel wood burning stove fitter based in East Sussex. 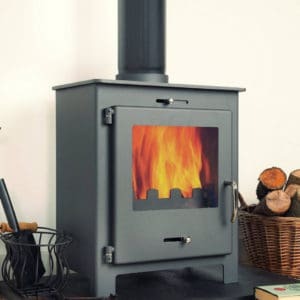 I supply, install, sign off and maintain wood burning stoves for Customers all over Sussex and Kent.